We all know that in an ideal world, breastfeeding is the best option for babies when we have the luxury of choosing – but unfortunately that’s not always the case. Luckily we have access to baby formula – a healthy alternative to breast milk when we’re unable to breastfeed bub; remember, fed is best. But how much do you really know about it? Here are ten facts to file away. Only 39 per cent of Aussie babies are still being exclusively breastfed by the age of three months, meaning there are a lot of bubs out there being bottle fed with formula. Some of the more common reasons for bottle over breast are the increase in mums going back to work quickly after giving birth, allergies and mothers being unable to produce sufficient breast milk. In the past when a mother was unable to breastfeed or had died during child birth, wet nurses or animal’s milk were used to feed babies. Cow’s milk was the most commonly used (being the most similar to human milk), but milk from other animals was also used such as goats, sheep and pigs – whatever was more available. In 1865 a true game changer happened when chemist Justus von Liebig developed and marketed the first formula food for infants – originally it was in liquid form but then it moved to powder (for better preservation). The formula was made from cow’s milk, wheat and malt flour, and potassium bicarbonate. Most baby formula is a powder made from cow’s milk that’s been altered with protein, fat, carbohydrates, vitamins and minerals to make it as nutritionally close as possible to breast milk once mixed with cooled, boiled water. Liquid formula (already prepared and ready to go) is also available but less commonly used. Both are a perfectly healthy alternative to breast milk with sufficient nutrients to adequately feed and nourish your baby before they start solids. Ready-to-feed liquid formula needs to be refrigerated within two hours of opening, and then either used or discarded after 48 hours. Made-up powdered formula bottles can’t be out in the open at room temperature for longer than an hour and you should never keep and reheat it – be sure to throw out anything your baby doesn’t finish. If you want to make up a couple of powder formula bottles at a time you can, but you need to store it immediately in the fridge and feed it to your bub within 24 hours, otherwise it will need to be thrown out as bacteria will have started to form. Once a tin of formula is opened it can usually be kept for one month and unopened for one year, but consult the expiration date on the tin for more information. It is likely your bub will definitely consume it within this timeframe anyway – you’ll be more concerned with not running out! Don’t forget that all formula should be heated by sitting in a sink or bowl of warm water, or by using a bottle warmer, not the microwave, as studies have shown that it fails to heat the milk evenly, resulting in hotspots that can scald your baby’s throat or mouth. Breast milk contains more whey protein than formula which makes it easier for babies to digest – formula has more casein protein which is digested more slowly. As a result some babies (but not all), will feed less often with formula because they stay fuller for longer. Many parents have reported their babies sleeping for much longer stretches at night once switching to formula, but before you get excited it doesn’t always happen – so don’t jump on the formula bandwagon for this reason alone. Babies who are formula-fed have darker, thicker and stronger-smelling poos than those who are breastfed – oh what joy! They also don’t poo as often, but when they do, they’re big, smelly ones! Most bubs will happily slurp down cow’s milk formula, but some experience allergies to the protein it contains. Signs that your baby might be allergic to the formula you’re giving them include blood or mucus in their poo, diarrhoea, vomiting, irritability around feeding, discomfort and uncontrollable crying, or a skin rash. 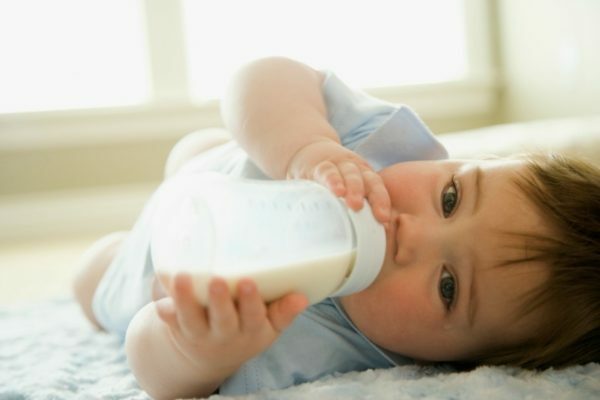 The good news is if your baby is allergic or intolerant to cow’s milk formula there are other options to try such as goat’s milk-based formula, soy-based formula and hydrolysed protein formula. There are also other specialised formulas for conditions such as reflux, preventing eczema and other issues (with added probiotics), as well as organic formulas. If you’re confused about which formula to use for your baby, don’t worry because they all contain very similar ingredients and nutritional elements. But if your baby has an allergy or specific condition, it’s best to speak to your doctor about which formula they recommend. Formula is also made for infants over six months of age and into toddlerhood. It’s important to purchase age-appropriate baby formula as each formulation delivers the increasing nutritional needs – more iron, protein and minerals – for growing children. Do you use formula for your baby?